Survey USA ran polls in 14 states and 21 cities to see who won the third debate. 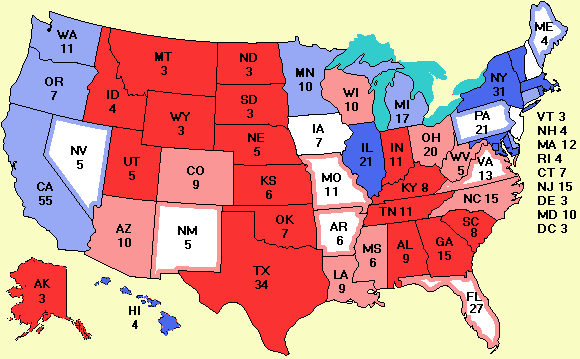 Kerry won in NY, NJ, ME, CA, OR,WA, IL, AR, PA, and CO. Bush won in TX, KY, and OK. Florida, as usual, was a tie. Among cities, Kerry won in 8 and Bush won in 12. When we look at cities in swing states, the mix is Kerry won St. Louis, Detroit, Las Vegas, Tucson, and Cleveland. Bush won Phoenix, Cincinnati, Des Moines, and Grand Rapids. When broken down by party, in all 35 areas, the Democrats thought Kerry won and the Republicans thought Bush won. Not much change due to the state polls today, although it looks like Arkansas is getting a bit closer. Excepting Florida, I doubt Kerry will win any states in the South though. Florida and the Midwest is where the big action is. All in all, the race is much closer than it now appears. If you add up the strong and weak numbers in the legend, you get Kerry at 198 and Bush at 222. If you then award Kerry New Jersey, which nobody except Strategic Vision thinks is even close, the score is Kerry 213, Bush 222. The rest are tossups. Many people have asked me to toss out Strategic Vision, but to stay impartial, I don't want to cherry pick among the pollsters. Look strange? To understand the numbers better you have to understand the polling process. The first poll came from calling households at random and asking if the respondent was 18 or over and a resident of the United States. This filter resulted in telephone interviews with 1022 people. Among this group Kerry has a lead substantially outside the poll's 3% margin of error. After asking about who the respondent planned to vote for, the interviewer asked: "Are you registered to vote at your current residence?" It turns out 15% were not. Once they were removed from the data, we get line 2, the registered voters, where Kerry is still ahead outside the margin of error. Next question was: "Are you certain or almost certain to vote?" Counting only the people who said yes, we get line 3 in the table, what are often called "likely voters." In short, in the adult resident population at large, Kerry is way ahead, but among likely voters it is a statistical tie. For this reason, each party will mount a massive Get-Out-The-Vote drive on election day to turn out their base. In an election as close as this one, the winner will probably be determined by which party does a better job. If you want your horse to win, be sure to vote and strongly urge all your friends, relatives, fellow students, coworkers, etc. to do so, too. Call them on the afternoon of election day to prod them if need be. Since supporting constitutional amendments seems to be "in" these days, I could support one saying that people who don't vote should be stripped of their right to complain about the government afterwards. I believe that Australia has a fine for not voting. This election is too important to sit out. The Washington Post has an interview with Charlie Cook, a political guru in the same league as the late Izzy Stone. Insiders pay a lot of attention to Charlie Cook. He warns that the polls are missing the cellphone-only voters, a topic that has been discussed on this site repeatedly. He also says the election may be determined by events in Iraq. If it gets much worse, Bush is in deep trouble. Cook also confirms what I have heard from many, many sources: the undecideds ultimately break at least 2:1 for the challenger. An incumbent president has to be polling 49% to 50% going into the election. A 47% to 47% tie in the polls means the challenger wins. The interview is worth reading. Senate news: A new poll in South Carolina puts Inez Tenenbaum within 3% of Jim DeMint in their race to succeed retiring Democrat Fritz Hollings. DeMint was expected to win easily. A new poll in Louisiana has Republican David Vitter holding steady at 43%, with his three Democratic challengers together at 33% and 24% undecided. The problem for Vitter is that the undecideds are probably undecided about which of the three Democrats in the race they want to challenge Vitter in the December runoff. Remember that no Republican has ever been popularly elected to the Senate from Louisiana in history although a couple were appointed by the state legislature during reconstruction. More Senate news: I got a lot of mail about Sen. Bunning, both positive and negative. For me, the bottom line is still: when a U.S. Senator is incapable of giving a 2-minute speech unless he is hidden in a secret room with a TelePrompTer, he obviously has some kind of (mental) problem. A fully-functioning U.S. senator can talk for hours on end--sometimes days on end--if given half a chance. Bunning can squelch this story instantly by scheduling a 90-minute live televised press conference and inviting every newspaper and TV station in Kentucky to send a reporter. Let's see if he does it. I have installed a third server to try to survive any future attacks. This one is in Florida, a fitting place since the election may be decided there. To be able to distribute the data base every day from the primary server to the secondaries in a secure, hackproof way, new software had to be installed and a bug in the distribution software resulted in no map yesterday for people hitting the secondary. Sorry about that. In the event of another attack on www.electoral-vote.com, try www.electoral-vote2.com and if that fails, try www.electoral-vote3.com. Using multiple URLs makes the site more robust against certain kinds of attacks. Please make a note of these emergency URLs. Under normal conditions, please don't use them because they are much slower than www.electoral-vote.com, which is a pair of very fast Pentium 4s with extremely fast network connections. A number of people mentioned that I had missed the recent Chicago Tribune polls. Actually they are there. I always list the pollster, rather than the media outlet if I can find it. In this case it was Market Shares Corp. Thanks to your generous donations, I am now running ads for this site on the websites of 25 college newspapers in 12 swing states. See the donations page for the list. I think we have about covered the swing state universities. There is still $2000 in the kitty and I am open to suggestions of where to advertise besides college websites and political blogs. A few hundred dollars a week is the right price target.